She is a 12-year-old University of Baguio high school chess player. She won in the girls’ under-12 division of the 2013 National Age-Group Chess Championships which was held on 6-14 April 6-14 at the Taguig City University auditorium. She represented the Philippines and won a gold medal in the under-14 age group in the 14th ASEAN+ Age-Group Chess Championship held in Chiang Mai, Thailand last 6-14 June 2013. She is one of the players who represented the Philippines in the under-12 age group in the Asian Youth Chess Championship held last 20-27 June 2013 in Sari, Iran. She won in the 2014 National Age Group Chess Championship Grand Finals held in San Antonio, Quezon Province last 21-27 April. 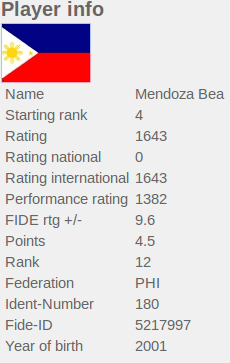 Even though she is struggling financially for her international performance, she still won bronze medal in the Rapid Chess - Girls Division of the 2014 Philippine Olympic Committee-Philippine Sports Commission (POC-PSC) Philippine National Games held in Makati City last 20 May 2014. She is part of the three-girl team representing Philippines in the under-14 division of the 15th ASEAN+ Age-Group Chess Championship currently happening in Sands Cotai Central, Macau which is from 3-12 June 2014. Bea Mendoza along with her mother slept in Luneta and in the malls in Manila because of lack of money for lodging but still was able to go and join her team in the 15th ASEAN+ Age-Group Chess Championship. It will be the second stint for Bea Mendoza in the ASEAN+ Age-Group Chess Championship. Bea Mendoza is the reigning National Under-12 Girls Chess champion which paved her way to have an opportunity to compete in the Macau competitions on a new level which is the 14-under division. “I just hope to have a good showing,” were the words of a bashful Bea Mendoza as a player in the 15th ASEAN+ Age-Group Chess Championship.